I don’t do these often, as I’m completely cackhanded at applying nail varnish, but I had to post about this colour, I love it so much. It’s a lovely, velvety, chocolatey-purple shade, not too warm, and not too brown. It’s a cream finish, with no shimmer or glitter. It’s rather unusual, and reminds me a great deal of the colour of proper, old-fashioned cocoa powder in the tin. 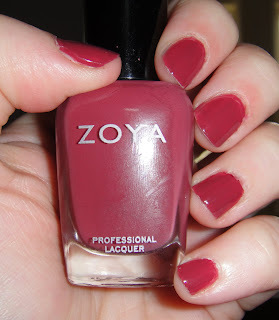 Zoya’s varnish is a massive cult in the US, and should really be better known in the UK. Their formulas are toluene and formaldehyde free (and vegan friendly! ), and though the the varnish itself s a bit thin and runny (I found it very streaky after one layer) but I was very pleasantly surprised at how rich the colour was after two coats. The above pic is of two coats and is finished with a layer of seche vite top coat. I got my polish from Organic Pharmacy, but you can buy it online in the UK from Nail Care Club for £9.29 a bottle. Vegan chemical lite nail varnish? Blimey. If I did nail varnish I'd be tempted. Good to know it exists. This colour is so pretty. It would look great too under a matte top coat. I don't usually do pink but this one is funky enough where I would happily sport it. Oh, you're right, it would look wonderful with a matte topcoat! I wonder where I can get my mitts on such a thing?